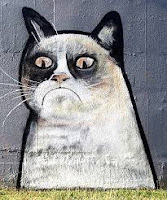 Roskill Community Voice: Going in to bat for Grumpy Cat! Going in to bat for Grumpy Cat! Three Kings locals and anyone who reads the Central Leader will be well aware of the saga of Grumpy Cat, the extremely popular mural that mysteriously appeared on the Big King reservoir, only to be painted out by Watercare contractors. It was a case of Council rules not quite aligning with the local community perspective. After Grumpy Cat was removed, there was an outcry from locals. The Central Leader was over-run with letters calling for the return of Grumpy Cat. People said that an attractive mural like GC was far better than a drab grey wall, which inevitably invites tagging. The good news is that Watercare, who are responsible for the reservoir, responded to this community pressure by opening the door a little, saying that they would consider a proposal from the Local Board to have another mural on the reservoir. Then, go to Watercare with the proposal. We're really hopeful that with a bit more advocacy we can get a really good outcome, and maybe even see the return of Grumpy Cat! The Board meeting is tomorrow, Thursday 25 July, from 6pm at the Fickling Centre and members of the public are welcome to attend. Authorised by Robert Gallagher, 15 Torrance St, Auckland.. Simple theme. Powered by Blogger.